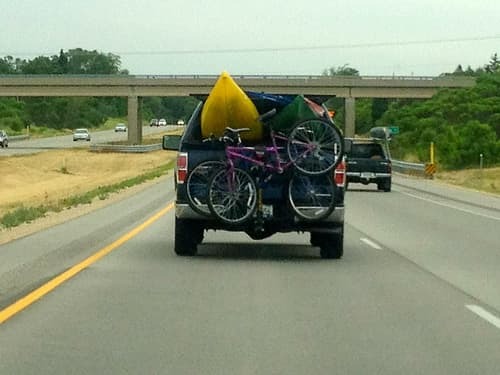 Packing up your pickup truck for a summer road trip is a no-brainer. It only takes looking out a clear, blue sky to make dreams of the open road all the more appealing. However, it’s important to know how to take care of your pickup in the summer heat before you pack the cab with beef jerky, coke bottles and your trusted GPS. Check your tire pressure first. A high heat index will affect the pressure. Grab a gage and consult your owner’s manual to ensure that you’re not on the road to a blow-out. While you’re at it, check the spare tire. Being stranded on the side of the road with no spare can end an enjoyable road trip really quickly. Change your oil more frequently in summer months. Higher temperatures lead to thinner oil, which burns off more quickly and won’t protect your engine as efficiently. To avoid overheating, be sure to check coolant levels. Your pickup truck is designed to cool itself off when you’re stuck idle in a summer traffic jam. However, if your coolant is low the engine will not be able to successfully cool itself, which can lead to parts melting together and a very high mechanic bill. Checking your battery regularly is good advice year-round. However, in the summer, the heat can cause your battery to overcharge. Keep your battery clean by regularly detaching cables and cleaning terminals with a rag. Before hitting the open road, replace your windshield wipers. Winter can be hard on wipers, the ice and snow can cause a great deal of damage. New wipers could mean the difference between life and death should you find yourself suddenly driving in a summer thunderstorm. While it might be the safest option to pull over and wait out the storm, you need to be able to see the road to safely pull off to the side. While driving with the windows down may seem appealing when summer offers mild temperatures, open windows may not cut it when the temperature hits 100 degrees Fahrenheit and you’re stopped on the interstate. Check refrigerant levels on your pickup’s air conditioning before summer sets in. You may be in need of an A/C recharge. Although we may be humming “On the Road Again” by May 31st, and itching to pack the car by June 1st, it’s important to make sure your pickup can make the drive before you head out to see the world’s biggest ball of yarn.